The Fiat G.8 was a military utility aircraft produced in Italy in the mid-1930s. Its design and production were undertaken at the CMASA works in Pisa which became part of Fiat in 1930, hence the type is sometimes referred to as the CMASA G.8 or Fiat-CMASA G.8. It was a conventional biplane design with staggered wings of unequal span braced by struts arranged in a Warren truss. 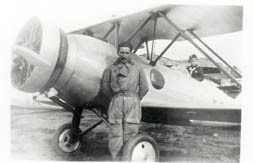 The pilot and a single passenger (or instructor) sat in tandem open cockpits, and the aircraft was fitted with fixed tailskid undercarriage with divided main units. Sixty of these aircraft were purchased by the Regia Aeronautica and used for liaison and training duties. Taylor, Michael J. H. (1989). Jane's Encyclopedia of Aviation. London: Studio Editions. pp. 389. "Aerei Italiani - Scheda Tecnica - Cmasa G.8". aerei-italiani.net. http://www.aerei-italiani.net/SchedeT/aereocmasag8.htm.